The public transport industry is transforming. The Land Transport Industry Transformation Map (ITM) launched in February spells out initiatives that leverage emerging technologies to increase productivity, achieve smarter mobility and provide better service for commuters. The vision is to bring about an innovative land transport industry enabled by technology and a highly competent workforce. In the last of this three-part series, we look at how smart technologies such as drones, data analytics and condition monitoring help the industry carry out inspection and maintenance duties more effectively. Senior assistant project engineer Nur Amira Amran is part of the design instrumentation team for the Thomson East Coast Line (TEL) project. She is also a member of the LTA Drone Task Force, which was set up to test the use of drones for inspection purposes. In her main role, the 23-year-old is in charge of supervising the installation of monitoring equipment on-site and assessing instrument readings for underground movement to ensure that the ongoing construction of the TEL stations and tunnels are safe and progressing as planned. 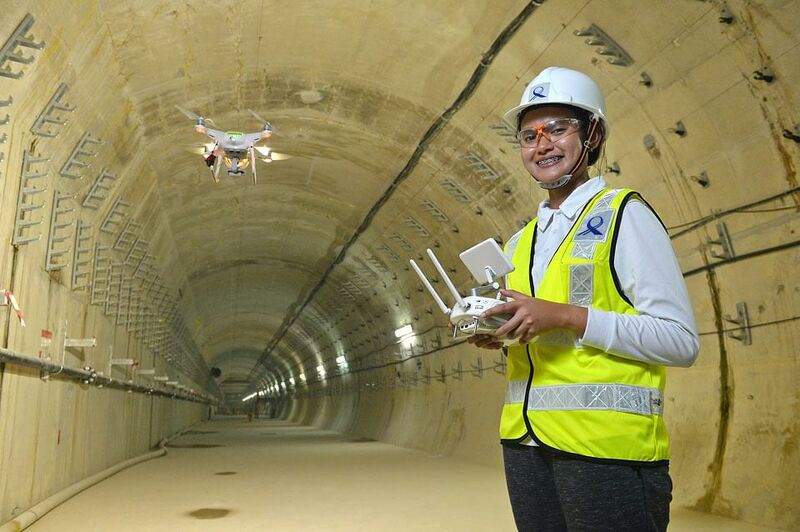 As part of the LTA Drone Task Force, she is also involved in testing drones to explore how they can be harnessed to monitor construction progress and inspection of underground tunnels. Being in the team also allows her to find out more about how technology can be used in the construction and transport industry. Traditionally, tunnel site inspections have been carried out manually by engineers who enter the tunnels to take photos and videos. “We are exploring if drones that are fitted with cameras can be used to monitor construction progress and inspect underground tunnels. This will boost efficiency as the drones can be used to access difficult-to-reach areas and allow us to carry out intensive supervision,” she says. Recently, Miss Amira attended a course to learn more about 3D photogrammetry mapping via drones. LTA is currently exploring to harness the technology to map ongoing construction sites. This technology will allow staff to focus on specific areas when monitoring construction progress. It is also able to create visualisations to help in planning. Miss Amira started out as an intern in LTA when she was pursuing her diploma in civil engineering in Singapore Polytechnic. She will complete three years in the organisation next month. One of the challenges she faces at work is a steep learning curve and learning how to assert herself in a predominantly male sector. She overcomes them by persevering and staying optimistic. Her biggest motivation lies in knowing that each day she spends working at the site allows her to contribute to better rail connectivity for Singaporeans. At 1am, the last train rolls into the depot, marking the end of commuter service for the day. 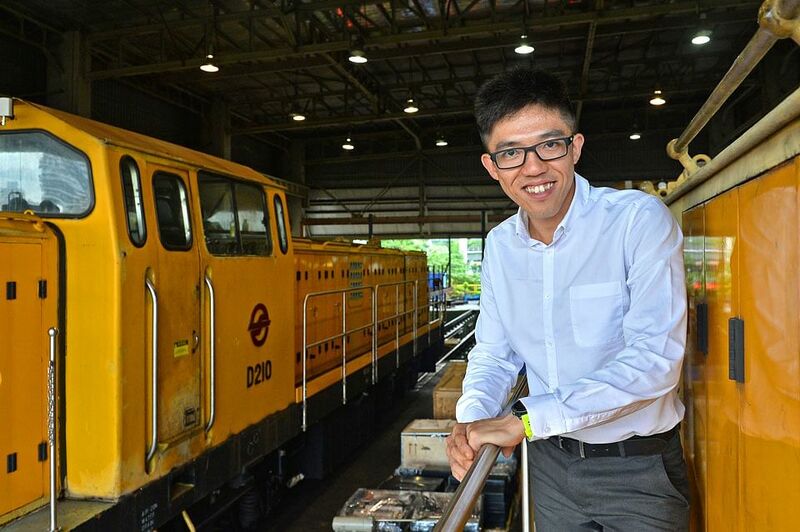 But for SMRT Singapore’s Wayne Chen, 35, and his team of engineers, the job of maintaining the country’s close to 200km of rail tracks has just begun. Their time window is short — the crew performing maintenance on the ageing North-South and East-West lines has from 1am to 4am to complete the work. To perform stringent checks in such a short time, the maintenance team uses a range of equipment. “We utilise technology such as the Multi-Functional Vehicle, which scans our network for anomalies so that defects can be detected early,” Mr Chen says. • The Track Tamping Vehicle, a bright yellow locomotive, which is used to pack ballast on the track bed. This helps the sleepers on the track to support the rail and ensure a smooth ride. • The Rail Grinding Vehicle corrects the wear-and-tear occurring from heavy track usage and any defects on the surface of the rails to prevent damage to the train. Other than equipment, Mr Chen also implemented changes to the maintenance process. He recently embarked on a project to improve the efficiency of track patrollers. “Instead of the traditional method of walking along the track to find defects with a torch light, we will replace it with a vehicular inspection system,” he says. Raising productivity is crucial because it frees up time for other maintenance work, he adds. “SMRT works with other metro operators, research institutions, consultancy firms and companies to see how we can increase maintenance productivity,” he says. Mr Chen obtained first class honours when he graduated with a Bachelor of Engineering (Mechanical) from Nanyang Technological University in 2008. He is currently pursuing a three-year post-graduate course in railway engineering to sharpen his technical competencies and keep up with the complex functions of the rail network. The continuous challenge of providing a seamless journey for commuters every day keeps Mr Chen motivated at work. He remains optimistic despite occasional disruptions. “Our progress is not immediately obvious, but I believe our efforts will pay off,” he says. 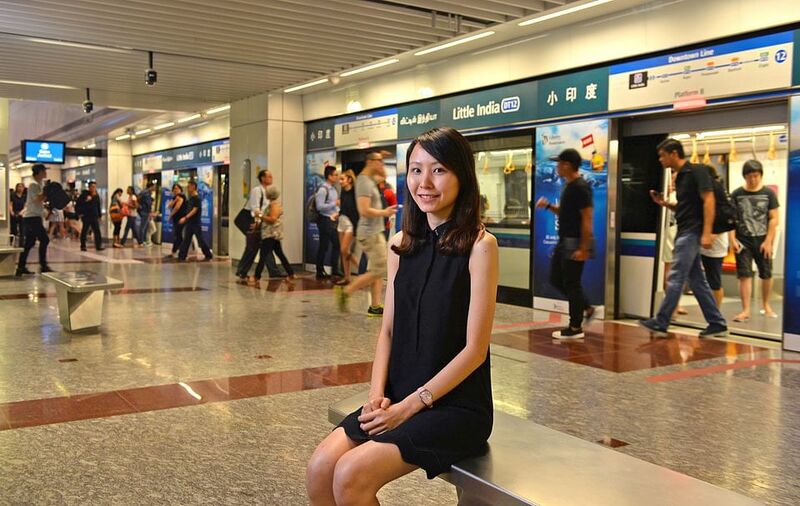 Ms Cheryl Lai, data scientist at the Land Transport Authority (LTA) uses data analytics to identify trends in the train system. She uses it to devise proactive maintenance strategies to fix possible snags before they become problematic. The 27-year-old works in the information technology, cybersecurity and digital services group at LTA translating numbers into viable and effective solutions that make things work better. Having graduated with a Master in Physics from Nanyang Technological University in 2015, Ms Lai’s experience doing research opened her eyes to the usefulness of data in proving hypotheses and substantiating theories, sparking an interest in how data analysis could be applied to solve real-world problems. This eventually led her to join the public transport industry. With no experience in programming, she had to learn rapidly as her job involved lots of coding. “It was a steep learning curve, but there were many useful tools online and I spent large amounts of time on the weekends practising,” she says. Her job requires her to stay abreast of new developments. She attends workshops, product launches and even goes on overseas study trips to learn about new technologies. For instance, in March this year, she visited Shanghai, Hangzhou and Shenzhen where she learnt about how AI and data analytics can be used to improve traffic conditions. Her favourite part of the job is the “eureka” moments she gets from analysing data. Identifying problems early and conducting targeted maintenance not only saves time and manpower, but also prevents potentially disastrous situations and inconvenient breakdowns. Learn more at www.lta.gov.sg/movingyourworld on the diverse opportunities for your professional growth.